Peak Resorts, the publicly-traded parent company of Hunter and 13 other mountains in the east, says the expansion will cost around $9 million and add $1.5-2 million in incremental earnings annually. All necessary approvals are in place and construction is set to begin this month. No manufacturer was announced but the lift is likely to be built by Leitner-Poma as all of Hunter’s lifts were, save for one Hall. This is huge for the Catskills and everyone who skis there. First large scale terrain expansion since Belleayre built their West Side in 1999. I look forward to seeing the final map of the new trails and where they’re going, and eventually skiing them and riding the lift. If this lift goes LP it will be the first with the LPA-6-OC chairs in the east, although there will be four with LPA-4/6-CC chairs after this construction season. (Bluebird, Sunburst, Quantum, Snowdon). The trails are marked in the woods below Way Out and I understand tree removal will start as soon as the snow there melts. A little surprised they aren’t making it go all the way to the top. Might put lots of pressure on that old HSQ on westside. Also, another summit lift might partially save them from the disaster that they had earlier in the season (2/3 of the summit lifts closed, so you had to drive over to ZE lift to get to the top). They’d overload the top of Belt Parkway and White Cloud if they did that. The trails all come off of Wayout and Belt Parkway so it makes sense to just have the lift end where it’s planned. The West Side lift never has a line and it’s a quick run down Wayout to it for summit access. And you can get to this lift from the D triple according to the earlier map by taking Drop off and then get over to the West Side lift. And now they will neither confirm nor deny that it will be a bubble six-pack. Peak resorts has been a fan of bubbles since they installed Bluebird at Mt. Snow. I’m betting that this new lift will have bubbles and will be built by Leitner-Poma. I don’t think they’ll get bubbles. 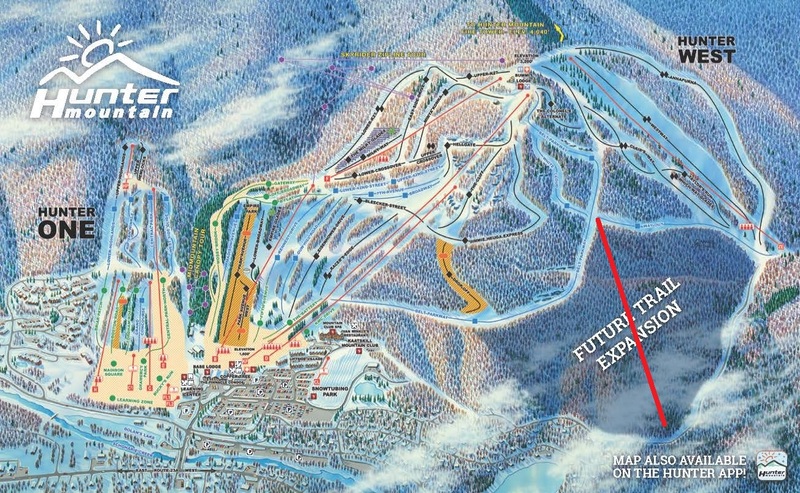 It’s not even going to be their main lift like Bluebird is at Mount Snow. From that comment, it seems like it will be a bubble chair. Max has a good point about Peak resorts but I don’t know why they would spend so much money on such a short lift. This could possibly be the first of many new lifts going up on Hunter. The Slutzky’s had another West Side expansion planned long before the mountain was bought by Peak Resorts. The liftline was cut, but the project was abandoned. Also, I’m pretty sure that this isn’t the only project Peak Resorts has planned. Personally, I’d like another detachable on the main face, either D or F, and a replacement for the E double chair.